Walls were continuously being damaged by equipment, carts, wheelchairs, recliners and gurneys in high traffic patient areas such as corridors, elevators and day surgery rooms. Kitchen and cafeteria walls near the trash cans, cart wash area, and pots and pan sink needed constant repair and painting from cart damage and prolonged hot water exposure. Short-term repairs and painting were causing costly, on-going disruptions in hospital operations and did not provide the clean, crisp appearance necessary in the healthcare facility. Hospital walls feature Corian® interior wall surfacing. Finding cost-effective surfacing materials that are durable enough to withstand the high traffic abuse of a busy hospital. Using materials that are non-porous in all hospital applications, especially where there is standing water that can breed bacteria or disintegrate the finish of a surface to the point where it cannot be properly disinfected. Selecting surfaces that not only look beautiful, but are highly versatile for a wide range of hospital applications. Corian® solid surface is tough, long-lasting and can stand up to abuse in high traffic areas in hospitals where it will look beautiful for many years. Non-porous and virtually seamless Corian® is resistant to stains and mould, mildew and bacteria growth. It is easy to clean as there no grout- or seam-gaps to trap soil. 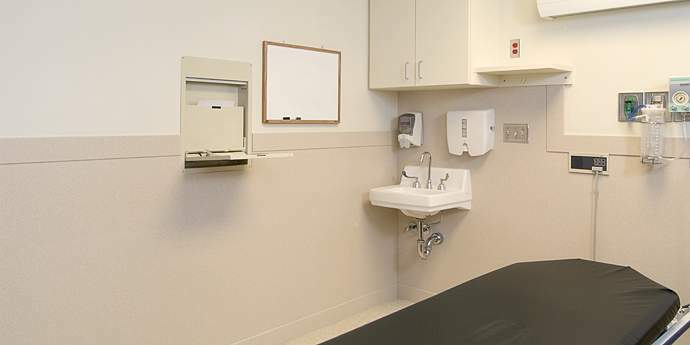 Corian® can be fabricated for use in many durable applications such as wall cladding, corner guards, hand rails, back splashes, elevator cab cladding, trash receptacle covers, nurse’s stations and windowsills. Corian® surfaces eliminated constant wall repair caused by cart damage. 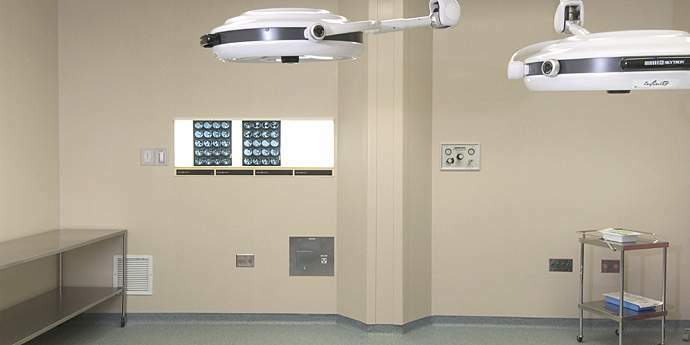 Corian® saves Bozeman Deaconess Hospital $30,000 – $50,000 per year in wall repair and painting costs. It is durable and renewable helping to eliminate inconvenient and complicated patient area maintenance. Corian® is solid all the way through. It resists chips, cracks and scratches. Corian® will remain looking as clean and new as the day it was installed with simple, proper cleaning and maintenance. The versatility and extensive colour palette of Corian® provides unlimited options in healthcare applications.